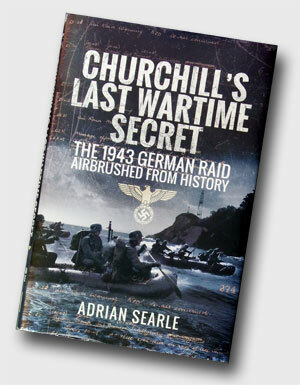 In late 2016 Churchill's Last Wartime Secret: the 1943 German raid airbrushed from history by Adrian Searle was published by Pen & Sword. The book boldly claims that the Germans mounted a successful commando raid against the Isle of Wight and that the British Government, even today, is trying to cover it up. I have had an enormous amount of trouble putting this piece together; the book has so little relevant substance to it that it's hard not to reproduce it all here. You can surmise from this that I do not believe the Germans landed. The first impression upon handling a hard copy of the book is that you don't get much for your £19.99; just 180 pages. If you discount the bibliography, references, notes and index, you have 166 pages of "content". Then remove/foreshorten some of the unnecessary material that lies in the body such as a fully-detailed account of the 1942 British raid on Bruneval to capture German radar equipment and biography of one of the key "witnesses" and you probably have less than 100 pages of material actually related to the "raid" or research thereof. The title Churchill's Last Wartime Secret is clearly intended purely to sell copies; by linking the Prime Minister to a 'secret' we have a nice hook for the unsuspecting reader. I personally missed hearing about Churchill's penultimate wartime secret, but I'm sure there'll be another book along in years to come also claiming to be a secret that Churchill took to his grave. In actual fact, this book only mentions the Prime Minister a handful of times, none of which actually link him to a cover-up. 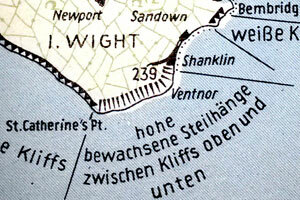 The book claims that a German raiding party landed on the Isle of Wight in 1943 and spirited away some technical equipment and prisoners from a radar installation. Casualties supposedly occurred on both sides. Evidence used to support this comes from two "eyewitnesses" who were involved in the raid. There are numerous threads of information that feed into Searle's overall picture, but we only need to focus on the most important ones here. 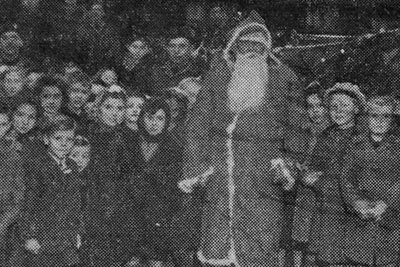 Chapter 5 comprises a 16-page biography of Dr. Alfred Laurence, who was a German Jewish postwar Isle of Wight resident. See the book for details as, although his story is undeniably interesting, it is not directly relevant to the alleged German raid. Laurence's role in all this is that he established contact with a German veteran of the "raid" and had "verbal advice" (p110) from him on the "complex" operation. Laurence's biography continues into chapter 6, when we are introduced to Friedrich Andernacht, Laurence's informant and alleged participant on the raid. Andernacht's biography is included (again, read the book). We will examine his evidence of the "raid" later. Source: "The German Naval Officer"
Make of this what you will, but the story goes that, in 1981 Sprack spoke to this informant (again, supposedly an academic and therefore to be believed) and regaled the details to Searle 35 years later in 2016. The book is littered with references to the credibility and reliability of the above "witnesses." The reason for this is that credibility is absolutely crucial to Searle's story and the reader is constantly directed to the trustworthyness of those involved in telling this tale in the hope that the credibility rubs off onto the information. Indeed, Searle suggests on page 110 that to doubt Andernacht's "word on a historical incident in which he was himself involved, would amount to an insult. There was no plausible reason for him to fabricate the story..." It seems that Searle does not want anyone to question this issue. But that's OK, as we don't need to. Credibility of a person and what a person believes are not related. For example, take the Archbishop of Canterbury and Professor Richard Dawkins; both highly respected, credible people, but what they believe about religion is diametrically opposed. Therefore, we need to forget the credibility of the individuals in the reporting chain (life's too short to try and sort that mess out) and actually test the credibility of the "information" they provided. Let's backtrack and summarise the evidence from the two German "witnesses." We'll analyse these snippets of information in due course. Searle devotes chapter 8 to discuss other research. Using local archives appears to have gained some ground, but use of the resources at the National Archives (TNA) at Kew seems to have been an absolute disaster. Marked 'secret,' this document is dated 28 August 1943 but had been 'signed off' on the 25th - just ten days after what appears the most likely date for the St Lawrence landing. Potentially therefore, it is highly significant evidence. The text is riddled with accusations of a cover up, but no verifiable evidence is offered to support this idea. Gareth Sprack's anonymous informant conveniently accused British Naval Intelligence of weeding the German archives after the war (p128). Why they would remove evidence of an insignificant raid when files relating to V-weapons, chemical weapons, Enigma and intelligence on the Soviets would be of prime importance, is not clarified. We then have a local eyewitness who was in the ARP on the night of the "raid". He and another ARP member were "invited" to sign the Official Secrets Act the following day (17 August) to prevent them from revealing information. (p140) Searle uses this as evidence of a "man from the Ministry" being ushered in to cover-up the German "raid:"
Searle is so wrapped up in the "evidence" that he seemingly fails to consider the obvious reason for a lack of official documentation of a German raid: THERE WAS NO GERMAN RAID! I need to challenge Searle's comments in the above quote and explain why I called his TNA research an "absolute disaster." On page 126 he states that a search at TNA for the war diary of 7th Somerset Light Infantry "proved fruitless." I find this somewhat incredulous. I checked my own research records and found that I had viewed this file (TNA WO 166/12709) on 16 October 2014, but not in relation to the battalion's time on the Isle of Wight. All you have to do is type "7 somerset light infantry" into the TNA's online "Discovery" catalogue and the 1943 file is the second on the list; see for yourself! Ironically, Searle was so, so close to getting to the bottom of the "raid" of 15-16 August 1943 and, had he made effective use of the National Archives, he would have found the evidence that I did. I would first like to pitch in with some thoughts on the "eyewitness evidence." 1. The convalescent unit: I don't believe the Germans would mount a raid using men who have only just recovered from injuries. A Canadian cadre undertaking commando-style training at Cuckmere Haven in 1943 had nearly 30% drop out of the course, many due to old injuries that prevented the men from undertaking the gruelling assault training. A commando raid is not "minor military duties." 2. The capture of a "broadcasting or emission device of considerable size, made of metal" fitted with an automatic self-destruct mechanism: I'm no expert in radar technology, but I'm not entirely convinced that such devices were in existence except as anti-defusing 'disincentives' in aerial bombs. Firstly, radar technology was being developed on-the-fly and a booby-trap mechanism seems implausible for the boffins to have incorporated into the design as it would make maintenance rather awkward. 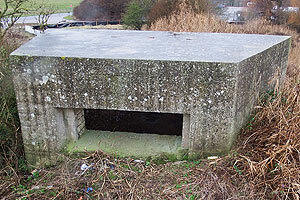 Secondly, to secure radar equipment, the British protected the entire facility from attack with perimeter fences and armed guards. 3. The use of a U-boat: U-boats were vital to Germany's war effort, attacking Allied shipping in the Atlantic. May 1943 saw the turning point for the Allies against the U-boat menace in the North Atlantic, so for the Germans to divert a boat from a major strategic campaign and park it up just off the British coast for 24 hours seems to be somewhat far-fetched. 4. The size of the raiding party: Searle appears to put the attacking force at perhaps ten men. Two of these are technicians, so we have potentially have just eight fighting men. This is not much considering the task at hand and given that the garrison will outnumber the raiders several times over. Complex tidal currents circulate around the island, with St Catherine's Point being particularly treacherous in heavy weather owing to rocky ledges extending up to half a mile offshore. A strong tide race, combined with nearby overfalls, eddies and isolated rip tides combine to make seas in this area difficult to predict. Vessels are encouraged to pass around St Catherine's Deep to avoid this area, some three miles from the coast. If you want to get a safe dinghy-distance from the coast, you probably need a surface craft like an E-boat to get in close. 6. Andernacht gives a date of May 1943 and the "Naval Officer" states that the raiders encountered British soldiers from either the DCLI or SLI. According to Searle, 5th DCLI and 7th SLI were both on the island in May 1943. By the time of the "raid" in August, however, both of these battalions had left. The only battalion of either of these regiments present in August was 1st DCLI - and it was seven miles away from St Lawrence! 7. The "man from the Ministry" conspiracy: signing the Official Secrets Act was a common occurrence and it appears that there were rumours circulating. If the OSA signing is related to the "raid", then it may just be case of trying to prevent rumours spreading. I know of German "raid" stories in East Sussex where the Field Security Police are trying to find the origin of the rumours. There are numerous other ways in which this story doesn't hold together, but let's take a look at the documents I found in the National Archives in search of some evidence. My research on the "raid"
I had eagerly awaited publication of the book as I was intrigued by the prospect of what lay within, even though I was somewhat skeptical. There are persistent rumours of German landings in East Sussex during the war and I have found no convincing evidence to suggest that they did. In hindsight, "SOUTCO, Bugbear, Cockade" would have been a slightly better choice of words; let me explain them. SOUTCO is short for Southern Command; Searle makes no reference to this at all, which was one reason I decided to look into the "raid", as it was clear that he might have missed key evidence. 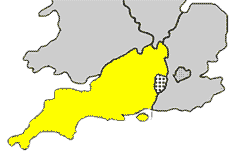 Southern Command was the regional formation (see the map at right) under which the Isle of Wight fell. SOUTCO answered to GHQ and had districts and sub-districts under its command. Bugbear was the code word to be issued in the event of a German commando raid; it should be in any book about German raids in the UK. Bugbear would trigger a predetermined plan of troop movements and counter-attacks, depending on the area in which the raid had been reported. Again, Searle does not mention Bugbear, although my research has since shown that we do not need to pursue this particular avenue for the purposes of this investigation. Operation Cockade was a deception plan involving the build-up of troops as though the assault on Occupied Europe was imminent. Exercise Harlequin was a dress rehearsal for the marshalling and embarkation procedures that would be used for Operation Overlord the following year. Harlequin fed into Operation Starkey (one of three operations under Cockade), in which a limited fleet put to sea in order to see what the Germans would do when faced by invasion. It was also hoped to draw the Luftwaffe into a decisive battle in which it would be defeated. Cockade ultimately failed as the Germans did not react to it. Oral evidence of anonymous "German Naval Officer"
I've already clarified my thoughts on the oral evidence, but the three documentary sources are what seemingly brings everything together; without these, the whole facade crumbles. The ARP log provides a date, while the Home Guard documents indicate an increase in the defences shortly after the "raid." Now, the Naval Officer identifies the target as St Lawrence radar station, but the ever-so-important ARP log states that the dinghies are off Ventnor, which is perhaps two miles away. Next, the NFS report "fires near pylons at Ventnor;" again, this is the wrong radar station. Note that St Lawrence is right on the coastline and on low cliffs. I always advocate fieldwork in my research, but I've never been to this particular part of the IOW, suffice it to say that a path from the beach below makes reaching the top of the cliff quite easy for a raiding party. I won't go into the detail of what radar equipment was at each location; Searle does this in his chapter 3, in perhaps too much detail for a radar layperson like me though. I mentioned SOUTCO above, but it may be of use to lay out the order of battle (ORBAT) as affects this investigation. In both of the above orbats, only the units/organisations relevant to us are shown. 47 Division was based on the mainland, with 140 Brigade on the IOW with the Isle of Wight Sub-District in charge of administration. I make this distinction as Searle makes a few references to a "47th Division sub-district" which is wrong. 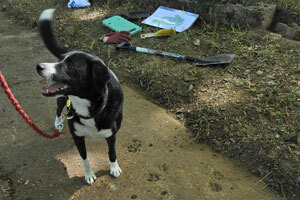 One of Searle's avenues of research was to investigate wartime burials in local churchyards. One from 1943 was that of Lieutenant-Colonel F.M. Eagar of the King's Shropshire Light Infantry (KSLI). Searle establishes the cause of death as a heart attack on 30 June 1943, but remains perplexed as to why an officer of the KSLI was on the island. (pp148-149) Within two pages of the relevant file, I found the answer; Eagar was in fact the Commanding Officer of the Isle of Wight Sub-District! A couple of temporary appointments were made to fill the position before Colonel R.E. Pickering assumed command on 13 July. It was while I was browsing this war diary that I encountered an entry for 20-22 August stating that Pickering "carried out recces of VPs (Vulnerable Points) on south coast IOW with object of forming a plan for the strengthening of existing defences." (TNA WO 166/10970) This is just before the Home Guard instructions Searle refers to were issued. Before we go any further, we should look at the VP aspect of the radar stations, with special emphasis on St Lawrence. But what was the perceived threat against St Lawrence and how did the British think the Germans may attack it? The quote above rules out a single raid on St Lawrence as unlikely, but documents survive that outline how a raid might occur. The following table is an extract from two separate documents, dated 11 May 1943 (TNA WO 166/10813) and 1 September 1943 (TNA WO 166/10970). In both of these documents (dated before and after the August "raid"), the information is exactly the same. Looking at the above data, it appears to describe two possible scenarios; attack by paratroops who depart by sea, or attack by both paratroops and seaborne troops who all depart by sea. Note that the seaborne assault element is dismissed as unlikely. So St Lawrence is vulnerable to a raid by paratroops but not deemed likely to have raiders arrive by sea. Table 2 below shows the moon and tide forecasts for August and September 1943. Note that the German "raid" of 15-16 August takes place on a night when neither the moon or tide is favourable for seaborne raids. (The data relates specifically to Sector 'D' in which the Isle of Wight lies, so presumably accounts for there not being a high tide that is best for seaborne operations. Tide suitability does differ in other sectors of Southern Command.) The inclusion of data for September will become apparent in due course. Judged by Allied experience there is no particular difficulty in landing small parties of men on lonely beaches. Owing to the difficulty of keeping contact and preserving silence such parties are not likely to exceed 50 men but might amount to as much as 200. They would be brought in by fast motor craft and landed by small boats. The danger area is limited to the Wash to Lands End. The rest of the coast of the United Kingdom is open to attack by parties landed from U boats but the numbers that could be landed are so small that the normal security measures of any important objective should be adequate. This raises some interesting points, namely that the Allies were the experts in commando raids (and presumably how to defend against them) and that the concept of these raids was not part of German policy at that time. The above document does talk about "major seaborne raids" (i.e, those involving large ships that needed nautical minefields to be swept) that would only be launched against objectives that would contribute to Germany's major strategy. For the Allies, this meant concentrations of men, shipping and equipment being readied for an invasion of Europe. This brings us conveniently round to the subject of Harlequin. To recap from above, Harlequin was a large-scale test of the marshalling and embarkation procedures that would be employed for Overlord in 1944. At the end of the embarkation part of the exercise, a small fleet of shipping would put to sea as Operation Starkey to try and trigger an anti-invasion response from the Germans. (b) Probable enemy objectives are VPs on South and SE coasts with small parties dropped at other points of the Island to cause confusion, damage communications, etc. Think back to Searle's "highly significant evidence" in the form of a Home Guard document dated 25/28 August that illustrates (to him) an overhaul of the defences in response to the "raid" that had happened a matter of days before. Searle's document is actually a response to the threat level being raised for Harlequin, NOT the aftermath of a German raid. The dates also fits with Colonel Pickering's recce of VPs to strengthen the defences 20-22 August. While we're here, let's put Searle's other Home Guard document into context too. The date of this document (25 September 1943), was the last day of Exercise Harlequin. I haven't seen either of these documents, but it seems that they illustrate the changing of defences in response to Harlequin, then relaxing them at the end of the exercise. Again, turning to the army documents, the IOW's defences were undergoing a reorganisation from 1 August; this resulted in a new 'Plan to defeat the enemy' being issued on 1 September 1943. While this was happening in the background, Harlequin raised the threat level for its duration. I will admit that Searle didn't do too badly in identifying army units on the IOW, but he was uncertain as to which unit was guarding the radar stations in August 1943. Well, the answer lay in the various documents that confirm that it was not the army in residence, but the RAF. 2745 Squadron arrived at Ventnor on 11 May 1943 and appeared to have left in the first half of October. 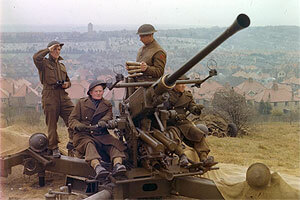 VPs on the General List (such as St Lawrence) were not an army responsibility, but the squadron were responsible for this and Ventnor, which was on the GHQ List. The Isle of Wight Sub-District was formed on 17 May and on the same day Colonel Eagar visited the compound at Ventnor to inspect the defences, so we can see this was an important issue. I can't verify the garrison strength at St Lawrence but 17 men were posted there on 11 May with another 19 on the 19th. 36 more were sent on 26 June for anti-aircraft defences, so it would appear to give us a figure of at least 72, providing these are cumulative numbers. So we can see here that the garrison at Ventnor at least, was well-rehearsed in its anti-raid role. Colonel Pickering inspected the defences on 20 July and three days later a 100% manning exercise was conducted. But how well would the defenders fare in the event of a raid? At 23:00 hours on 15 August, Ventnor radar station came under attack; the balloon had well and truly gone up. By which I mean Exercise "Balloon" which involved two companies of the 12th Fusiliers (British Army) attacking the compound. Just to clarify the above: the only raid on a radar station on the Isle of Wight on 15-16 August 1943 was a British Army training exercise! 15.8.43 2300: Exercise Balloon with Army. RAF Regt, "stood to." Two companies of the 12th Fusiliers attacked compound. 16.8.43 0100: RAF Regt represented Germans and went outside the Compound. 6 Observation Posts with four men and 1 NCO in each. Gun posts manned and striking force kept in compound. Unfortunately, this is all the information we have, but I think it's enough to explain where this is heading. The 12th Fusiliers make no mention of the exercise. Searle mentions that an air raid on Portsmouth also happened the same night, so we ought to construct a timeline of the known events. Table 3 below places the Exercise Balloon events and the ARP log entries in chronological order. Those entries relating to the air raid come from TNA WO 166/11145. 23:00 EXERCISE BALLOON with Army. RAF Regt, "Stood To." Two companies of the 12th Fusiliers attacked compound. 23:56 Four or five GCI plots about 50 miles south of Selsey. 23:58 Aircraft heard over the area. 23:59 - 00:02 Incendiary bombs and chandalier flares reported and alarm broadcast to all sites. 00:03 - 00:19 Main attack by a stream of approx fifteen aircraft which attacked singly. 00:15 Dornier 217 crashed in cornfield. 00:19 - 00:46 Sporadic attacks by approx seven aircraft using same tactics. 01:00 EXERCISE BALLOON: RAF Regt represented Germans and went outside the Compound. 6 Observation Posts with four men and 1 NCO in each. Gun posts manned and striking force kept in compound. 01:35 - 01:45 Three or four planes flying singly dropped bombs in area Portsmouth. 01:37 "IGNITE" ordered to Portsmouth smoke screen. 02:18 Dinghies of Germans seen. 02:40 Fires reported near pylons at Ventnor. 03:10 EXERCISE BALLOON "Stand Down" ordered. 04:32 "EXTINGUISH" ordered to Portsmouth smoke screen. To be honest, this doesn't really enlighten us much although it does show that the second stage of the attack on the radar station commenced in between the two air raids. The exercise ends 30 minutes after the fires at the pylons are reported. The fires may have been the result of pyrotechnics used in the exercise setting vegetation alight, although there is nothing to say whether blanks and thunderflashes were used or not. It certainly makes sense to extinguish the fire before another air raid comes down on the radar station itself, and maybe that's why the exercise ends shortly afterwards. As for the dinghies full of Germans, I can only guess that they were baled out aircrew, as we can now say that there was no German commando raid that night. One event I shall mention to avoid being accused of cover-ups myself, is that on 18 August, a static water tank at Ventnor was drained and what appeared to be a German signal cartridge (Type FSN 5) was found. How did it get there? Probably dropped by an aircraft or by an airman baling out. The exercise at Ventnor on 15-16 August was not an isolated incident; on 26 August Exercise "Astra" saw the RAF personnel at 100% manning of defences for 24 hours. This fortnight also sees the top brass inspecting the defences around all the various sites, so the subject is at the forefront of planning. Where does the raid rumour come from? Searle mentions a theory that Ventnor was used for a practice raid in preparation for Operation Biting, the British raid on Bruneval. (pp68-69) This would put it before February 1942, but we're not done with the activity of the summer of 1943 yet. Sept 4th 1943 20:00: Exercise "Man" - "Stand To" (Exercise with IOW Sub-District) Compound attacked by three companies 12th Fusiliers. 21:45 hours: RAF Regiment adopted second role as enemy. Two parties set out to escape to the beach. Parties represented German paratroops with technical apparatus attempting to reach boats. (My emphsasis) Both parties reached beach unchallenged and returned...unchallenged. Men of RAF Regiment entered into spirit of exercise. Their movement by night was particularly good. Note the line I highlighted in the above quote; the scenario sounds familiar doesn't it? Exercise Man was repeated on 5 September at three other radar installations: Bembridge, the Needles and the supposed target of the raid that never happened - St Lawrence. If not August 1943, was there a raid any other time? No. Look again at Table 1 above; the perceived threat to St Lawrence was an airborne one. The full document also rules out seaborne-only raids at Ventnor and Boniface due to their height and distance from the coast. The threat is from raids by paratroops who escape by sea. This is why Exercise Man's scenario involved paratroops. Had the Germans landed by sea on 15-16 August, that exercise would have encompassed that scenario as it had hitherto been ruled out as unlikely. Also have a second look at Table 2, which is the moon/tide suitability for raids. I included the data for September for a reason. If you take the dates of Exercise Balloon (15-16 Aug), Exercise Astra (26-27 Aug) and Exercise Man (4-5 Sept), you'll see that Astra coincides with favourable moonlight for seaborne raids, while Man takes place during good moon and tide states for seaborne attack. However, none of these exercises are staged when moon and tide for airborne assault is most likely - because this is the main threat! But they would have still covered it up, right? I don't think so; Searle talks of internal military documents not mentioning a raid, but this is nonsense. The British Army had to stomach a few unpalatable truths following military disasters in Norway, France, Greece, Crete, Hong Kong, Singapore and Burma. Had a raid occurred there would be absolutely no reason to cover it up internally as lessons had to be learned. Denying setbacks is not the way to win a war. In the case of August 1943, remember that Exercise Harlequin was followed by Operation Starkey, the object of which was to provoke a German reaction, whether it be troop movements, air attack or laying nautical minefields. Had a commando raid happened, the senior Allied planners would be over the moon and there is no way they would have sought to cover it up as it would be evidence that their deception plan was working. The information thus gained might be essential to the final planning of Overlord, so denying it happened was only of benefit to the Germans. I've looked at files listing all the German reactions to Starkey; there was no commando raid. Had there been a raid, there would have been a reaction to it; defences would have been tightened, such as Searle was trying to establish with his Home Guard documents. However, having been through thousands of documents relating to East Sussex, there is no ripple effect, no sudden revision of plans. The closest we get to that is the report of a company of German paratroops arriving at Cherbourg in April 1942. Southern Command is anxious about them, as is South Eastern Command. The files I've seen show the Canadians conducting exercises at VPs in East Sussex. The point is: when the Germans do something, the Allies in the UK react. There is no evidence of any reaction to a German commando raid that I know of. The whole story of the "raid" hangs on the above being related. I've demonstrated that the Home Guard documents are a reaction to the increased threat due to Exercise Harlequin and not a German raid. The Germans in dinghies could be downed aircrew, while the fires at the pylons of Ventnor radar station are most likely related to a British Army exercise simulating a German commando raid. The ARP members signing the OSA may be related to quashing rumours of a German raid. The German oral evidence is irrelevant as a result of the underpinning documentary evidence being reinterpreted. Where does this leave the German raid idea? Hopefully consigned to folklore where it belongs. The story as told only works for the date 15-16 August 1943 and you can see that that link has well and truly been broken. As there was no German raid, there was also absolutely no cover-up. Churchill's name was dragged into this conspiracy on the strength of opinion rather than fact, and probably only to legitimise a sensational book title for marketing purposes. Wherever the primary sources are! This may be the local archives or the National Archives; I've taken the (for me) rare step of including full references so that you can follow my research and check out the evidence for yourself. I normally don't do this as people have plagiarised my work in the past and made out that they did the hard work. In this case it's important for me demonstrate transparency in my research in order to validate the argument I've set out. But, if what you see here influences you, then remember to acknowledge when publishing/posting anything you do! This has been a long post (8,000 words). In reality I could have just posted the key extracts and killed off the myth in a few paragraphs, but I wanted to answer as many of the claims as possible with comprehensive evidence and hopefully you will agree that I have done this. There is a lot more to be done, but not by me. I did enough to seemingly get to the bottom of the story, but there will be much more evidence for somebody else to find beyond this little foray outside my area. There may be evidence uncovered that shoots down what I've said above, and that's fine - just have convincing proof to make the case! It is somewhat ironic that Searle set out to prove a story of a German raid, but it ended with me identifying a British raid! As for "The 1943 German raid airbrushed from history," we can see in fact it has been airbrushed into history! At least the truth about this event is now out.